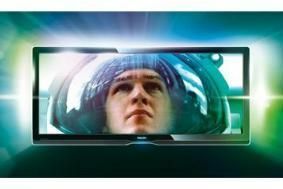 Philips to launch flagship Cinema 21:9 TV on June 18th | What Hi-Fi? Now the finished version is ready and will hit stores in the UK on June 18th for £4500. What's more, we currently have the finished item in our test rooms and will be publishing a full review in the August issue of What Hi-Fi? Sound and Vision, on sale July 1st. Just to recap, the Cinema 21:9 is a Full HD, 56in LCD screen with (as the name cunningly suggests) an aspect ratio of 21:9, rather than the more usual 16:9. Why so wide? Well, on a 16:9 TV films in full Cinemascope (21:9) ratio are displayed with black bars above and below the film image (known as 'letterbox'). However, on the Philips Cinema 21:9 model, the black bars will be removed and the film should fit the display precisely, giving a more "cinematic" viewing experience. But what about 16:9 pictures?, you may ask. Well, here the Philips set does some clever jiggery pokery and uses "advanced intelligent processing" to scale the image to fill the entire screen, without any noticeable distortion, claims Philips. All well and good, although old-fashioned 4:3 TV broadcasts will still appear with black bars down the left- and right-hand side of the screen. Additional technical highlights include Philips's 2009 Perfect Pixel HD engine, capable of processing 500 million pixels per second, 17-bit colour processing, a claimed 80,000:1 contrast ratio and 200Hz Clear LCD technology to minimise motion blur. Naturally, this being a Philips TV, it's equipped with Ambilight Spectra 3 LED lights on the back of the set, and you also get wi-fi built-in for access to Philips's new NetTV system, plus full DNLA certiification. At launch, the Cinema 21:9 will include a "smart levelling" wall bracket and five-year guarantee for an estimated street price of £4500. An optional swivel stand will cost £179. Find out more on the Philips Cinema 21:9 microsite.